The Holy Myrrh-Bearer Equal of the Apostles Mary Magdalene. On the banks of Lake Genesareth (Galilee), between the cities of Capharnum and Tiberias, was the small city of Magdala, the remains of which have survived to our day. Now only the small village of Mejhdel stands on the site. A woman whose name has entered forever into the Gospel account was born and grew up in Magdala. The Gospel tells us nothing of Mary’s younger years, but Tradition informs us that Mary of Magdala was young and pretty, and led a sinful life. It says in the Gospels that the Lord expelled seven devils from Mary (Luke. 8:2). From the moment of her healing Mary led a new life, and became a true disciple of the Savior. The Gospel relates that Mary followed after the Lord, when He went with the Apostles through the cities and villages of Judea and Galilee preaching about the Kingdom of God. 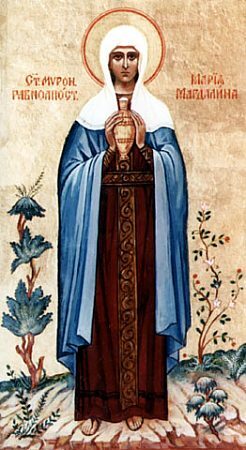 Together with the pious women Joanna, wife of Choza (steward of Herod), Susanna and others, she served Him from her own possessions (Luke 8:1-3) and undoubtedly shared with the Apostles the evangelic tasks in common with the other women. The Evangelist Luke, evidently, has her in view together with the other women, stating that at the moment of the Procession of Christ onto Golgotha, when after the Scourging He took on Himself the heavy Cross, collapsing under its weight, the women followed after Him weeping and wailing, but He consoled them. The Gospel relates that Mary Magdalene was present on Golgotha at the moment of the Lord’s Crucifixion. While all the disciples of the Savior ran away, she remained fearlessly at the Cross together with the Mother of God and the Apostle John. The Evangelists also list among those standing at the Cross the mother of the Apostle James, and Salome, and other women followers of the Lord from Galilee, but all mention Mary Magdalene first. Saint John, in addition to the Mother of God, names only her and Mary Cleopas. This indicates how much she stood out from all the women who gathered around the Lord. She was faithful to Him not only in the days of His Glory, but also at the moment of His extreme humiliation and insult. As the Evangelist Matthew relates, she was present at the Burial of the Lord. Before her eyes Joseph and Nicodemus went out to the tomb with His lifeless Body. She watched as they covered over the entrance to the cave with a large stone, entombing the Source of Life. Faithful to the Law in which she was raised, Mary together with the other women spent following day at rest, because it was the great day of the Sabbath, coinciding with the Feast of Passover. But all the rest of the peaceful day the women gathered spices to go to the Grave of the Lord at dawn on Sunday and anoint His Body according to the custom of the Jews. It is necessary to mention that, having agreed to go on the first day of the week to the Tomb early in the morning, the holy women had no possibility of meeting with one another on Saturday. They went separately on Friday evening to their own homes. They went out only at dawn the following day to go to the Sepulchre, not all together, but each from her own house. The Evangelist Matthew writes that the women came to the grave at dawn, or as the Evangelist Mark expresses, extremely early before the rising of the sun. The Evangelist John, elaborating upon these, says that Mary came to the grave so early that it was still dark. Obviously, she waited impatiently for the end of night, but it was not yet daybreak. She ran to the place where the Lord’s Body lay. Mary went to the tomb alone. Seeing the stone pushed away from the cave, she ran away in fear to tell the close Apostles of Christ, Peter and John. Hearing the strange message that the Lord was gone from the tomb, both Apostles ran to the tomb and, seeing the shroud and winding cloths, they were amazed. The Apostles went and said nothing to anyone, but Mary stood about the entrance to the tomb and wept. Here in this dark tomb so recently lay her lifeless Lord. Wanting proof that the tomb really was empty, she went down to it and saw a strange sight. She saw two angels in white garments, one sitting at the head, the other at the foot, where the Body of Jesus had been placed. They asked her, “Woman, why weepest thou?” She answered them with the words which she had said to the Apostles, “They have taken my Lord, and I do not know where they have laid Him.” At that moment, she turned around and saw the Risen Jesus standing near the grave, but she did not recognize Him. Then she recognized the Lord’s voice. This was the voice she heard in those days and years, when she followed the Lord through all the cities and places where He preached. He spoke her name, and she gave a joyful shout, “Rabbi” (Teacher). She came to herself and again ran to the Apostles, to do the will of Him sending her to preach. Again she ran into the house, where the Apostles still remained in dismay, and proclaimed to them the joyous message, “I have seen the Lord!” This was the first preaching in the world about the Resurrection. The Apostles proclaimed the Glad Tidings to the world, but she proclaimed it to the Apostles themselves. Holy Scripture does not tell us about the life of Mary Magdalene after the Resurrection of Christ, but it is impossible to doubt, that if in the terrifying minutes of Christ’s Crucifixion she was at the foot of His Cross with His All-Pure Mother and Saint John, she must have stayed with them during the happier time after the Resurrection and Ascension of Christ. Thus in the Acts of the Apostles Saint Luke writes that all the Apostles with one mind stayed in prayer and supplication, with certain women and Mary the Mother of Jesus and His brethren. Holy Tradition testifies that when the Apostles departed from Jerusalem to preach to all the ends of the earth, then Mary Magdalene also went with them. A daring woman, whose heart was full of reminiscence of the Resurrection, she went beyond her native borders and went to preach in pagan Rome. Everywhere she proclaimed to people about Christ and His teaching. When many did not believe that Christ is risen, she repeated to them what she had said to the Apostles on the radiant morning of the Resurrection: “I have seen the Lord!” With this message she went all over Italy. Tradition relates that in Italy Mary Magdalene visited Emperor Tiberias (14-37 A.D.) and proclaimed to him Christ’s Resurrection. According to Tradition, she brought him a red egg as a symbol of the Resurrection, a symbol of new life with the words: “Christ is Risen!” Then she told the emperor that in his Province of Judea the unjustly condemned Jesus the Galilean, a holy man, a miracleworker, powerful before God and all mankind, had been executed at the instigation of the Jewish High Priests, and the sentence confirmed by the procurator appointed by Tiberias, Pontius Pilate. Mary repeated the words of the Apostles, that we are redeemed from the vanity of life not with perishable silver or gold, but rather by the precious Blood of Christ. Mary Magdalene continued her preaching in Italy and in the city of Rome itself. Evidently, the Apostle Paul has her in mind in his Epistle to the Romans (16: 6), where together with other ascetics of evangelic preaching he mentions Mary (Mariam), who as he expresses “has bestowed much labor on us.” Evidently, she extensively served the Church in its means of subsistence and its difficulties, being exposed to dangers, and sharing with the Apostles the labors of preaching. According to Church Tradition, she remained in Rome until the arrival of the Apostle Paul, and for two more years following his departure from Rome after the first court judgment upon him. From Rome, Saint Mary Magdalene, already bent with age, moved to Ephesus where the holy Apostle John unceasingly labored. There the saint finished her earthly life and was buried. Her holy relics were transferred in the ninth century to Constantinople, and placed in the monastery Church of Saint Lazarus. In the era of the Crusader campaigns they were transferred to Italy and placed at Rome under the altar of the Lateran Cathedral. Part of the relics of Mary Magdalene are said to be in Provage, France near Marseilles, where over them at the foot of a steep mountain a splendid church is built in her honor. The Orthodox Church honors the holy memory of Saint Mary Magdalene, the woman called by the Lord Himself from darkness to light, and from the power of Satan to God. Formerly immersed in sin and having received healing, she sincerely and irrevocably began a new life and never wavered from that path. Mary loved the Lord Who called her to a new life. She was faithful to Him not only when He was surrounded by enthusiastic crowds and winning recognition as a miracle-worker, but also when all the disciples deserted Him in fear and He, humiliated and crucified, hung in torment upon the Cross. This is why the Lord, knowing her faithfulness, appeared to her first, and esteemed her worthy to be first to proclaim His Resurrection. By keeping His commandments and laws, holy Mary Magdalene, / you followed Christ, Who for our sake was born of the Virgin, / and in celebrating your most holy memory today, / we receive forgiveness of sins by your prayers. Standing before the Cross of the Savior, / Suffering with the Mother of the Lord, / The most glorious Mary Magdalene offered praise with tears. / She cried out: What is this strange wonder? / He who holds the whole creation in His hand chooses to suffer: / Glory, O Lord to Your power!